All residential addresses on both sides of the boundary roads and all no-exit roads off the boundary roads are included in the zone unless otherwise stated. Start point: corner of Beth Street and Fergusson Dr (Trentham). From the corner of Beth Street and Fergusson Drive, the boundary line runs northeast along both sides of Fergusson Drive to the intersection with Park Street (Maidstone). Fergusson Dr even numbered properties from 554 to 884 inclusive are in-zone. Fergusson Dr odd numbered properties from 549 to 993 inclusive are in-zone. The boundary line continues east along Park Street and then King Charles Dr and its side streets encompassing all properties in Kingsley Heights. From here the boundary line extends in a line west of Gorrie Rd and connects to Wallaceville Rd. 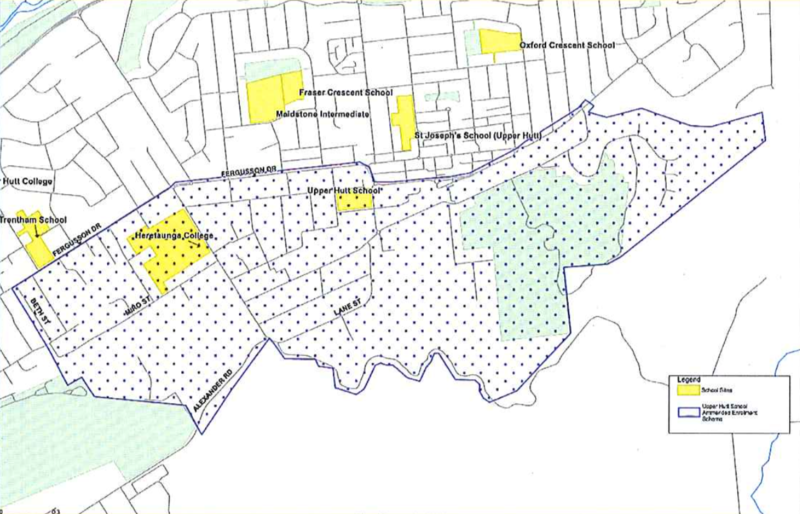 All Wallaceville Rd properties are in zone. Gorrie Rd is out of zone. From the intersection of Wallaceville Rd, Managaroa Valley Rd and Whitemans Valley Rd, the boundary runs south along Wallaceville Rd to the roundabout with Lane St, Ward St and Alexander Rd. The southern boundary continues along Alexander Rd to the edge of the Trentham Racecourse. From this point, the boundary line extends west across and around the outskirts of Trentham Racecourse and Summerset at the Course, to Miro St. 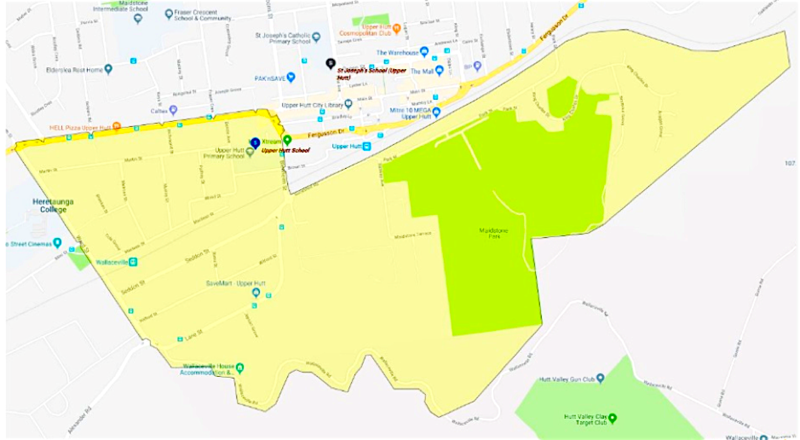 The boundary runs along Miro St and intersects through Ararino St to join with Beth St. From here the boundary continues along Beth St to connect back with Fergusson Dr.
Ararino St properties to the north of Miro Street and Beth St are in-zone (nos. 1, 4, 5, 7, 8, 9, 10, 11, 13, 15, 17, 19, 21 only). Each year, applications for enrolment in the following year from in-zone students will be sought by a date that will be published in a daily or community newspaper circulating in the area served by the school. This will enable the board to assess the number of places that can be made available to students who live outside the home zone. This priority category is not applicable at this school because the school does not run a special programme approved by the Secretary. Each year the board will determine the number of places that are likely to be available in the following year for the enrolment of students who live outside the home zone. The board will publish this information by notice in a daily or community newspaper circulating in the area served by the school. The notice will indicate how applications are to be made and will specify a date by which all applications must be received. First priority is not applicable at this school because the school does not run a special programme approved by the Secretary. Fourth priority must be given to any applicant who is a child of a former student of the school.